the cell, in association with The Custom Made Theatre Company, is thrilled to present a new play reading series. 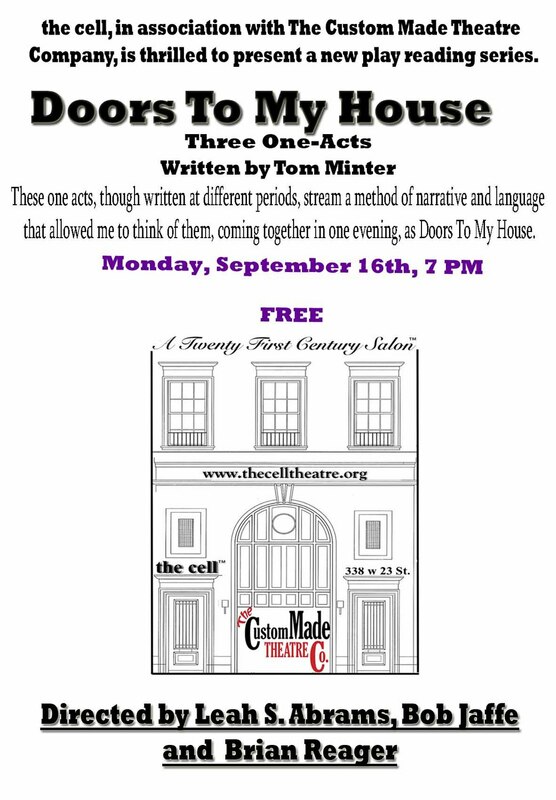 These one acts, though written at different periods, stream a method of narrative and language that allowed me to think of them, coming together in one evening, as Doors To My House. I've always loved Rod Serling, and grew up devouring the original Twilight Zoneseries. With my first endeavor at a one act, strawberry dwarfs and other lies, I had Serling's model in mind; start somewhere offbeat but ordinary, and then twist, allowing an arresting descent intosomething unexpected. Groundwork came as inspiration, after a little goad by a director; I knew I'd have two actors to work with, and fell into this two character absurdist piece, acting out a situation many writers have found themselves in. Collections Of A Working Mind is probably the most personal of these pieces. It relates to processing the real world - an adult world, by a child.